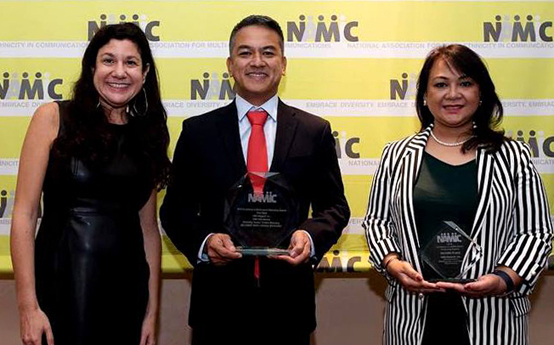 GMA Network, through its flagship international channel GMA Pinoy TV, brought home two more awards in the 2018 National Association for Multi-Ethnicity in Communications (NAMIC) Excellence in Multicultural Marketing Awards (EMMA) on top of its induction to the first-ever EMMA Top 5 Wall of Distinction. In the awarding held on Oct. 16 in New York, GMA Pinoy TV was the lone Philippine network to be recognized in the Wall of Distinction for proving its “commitment to excellence in multicultural marketing for winning the most EMMAs year-after-year since 2013” joining an elite group of some of the biggest media companies such as HBO, Univision Communications, Comcast NBCUniversal, and BET Networks. GMA Pinoy TV also bagged first place for “Becoming Pinoy: Amanda Bernardo” under the Marketing Tactics: Content Marketing category. The GMA Pinoy TV-produced interstitial ‘Becoming Pinoy’ is a series that profiles Filipinos born and raised in different cultures, and those of mixed ancestry. The winning episode, which was posted online, featured the story of Immigration lawyer Atty. Amanda Bernardo who defends people with deportation issues. “We are pleased to be honored this year with this award from EMMA. The citation for Becoming Pinoy is especially meaningful as it came just as we are celebrating the 30th Filipino-American Heritage Month. We share this honor with the members of the Filipino-American community who have been fighting for the diversity and inclusion,” said GMA Network First Vice President and Head of International Operations Joseph T. Francia. On the other hand, #SikatKaKapuso won second place in the Marketing Tactics: Social Media category. The GMA Pinoy TV-produced event “Sikat Ka, Kapuso”, which took place in New Jersey and Toronto in April 2018, was headlined by top GMA stars Dennis Trillo, Jennylyn Mercado, Lovi Poe, Alden Richards, Betong Sumaya, and Dingdong Dantes. The show aimed to bring Filipinos abroad quality Filipino entertainment. With the artists having substantial social media following, online promotions played a huge part in the success of the event. “This award is a tremendous boost to our digital marketing efforts as we endeavor to engage with our various target audiences through multiple touch points,”Francia added.